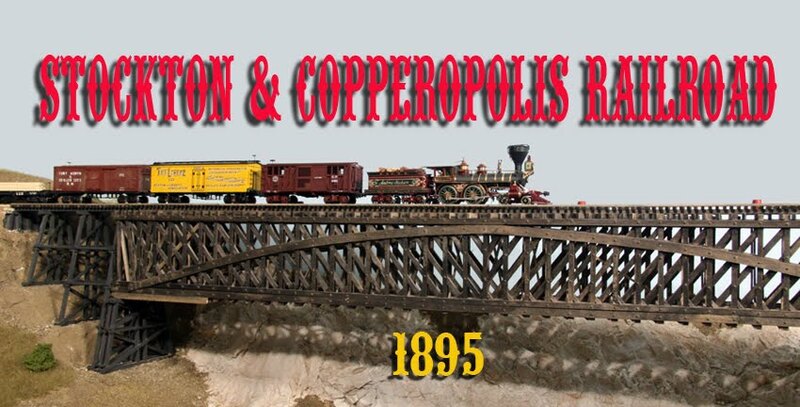 To have a model railroad function like a real one, an effective telephone system is a must, especially when you are operating in the era of timetables and train orders. The problem, of course, is how to design such a system and to make it work. When I started with this problem, I reviewed all the past articles in the model press, and there were not that many, but none of them really addressed the system I wanted. Basically, in the 1890s, those lucky railroads with telephone systems had a party line for the main train line. This I wanted to duplicate. I wanted a train crew to OS the dispatcher by simply lifting a receiver off the switchhook, waiting until any previous conversation was over and then talking to the DS directly. I also wanted the dispatcher to be able to flip a switch an use another system to contact the Operator when he had to dictate a train order or write a clearance. Fortunately, I had some period literature from Western Electric which showed the circuits and types of equipment that were used. Of course, I couldn't just order a WE part when I needed one so I still needed to find a circuit I couild build from readily available parts. 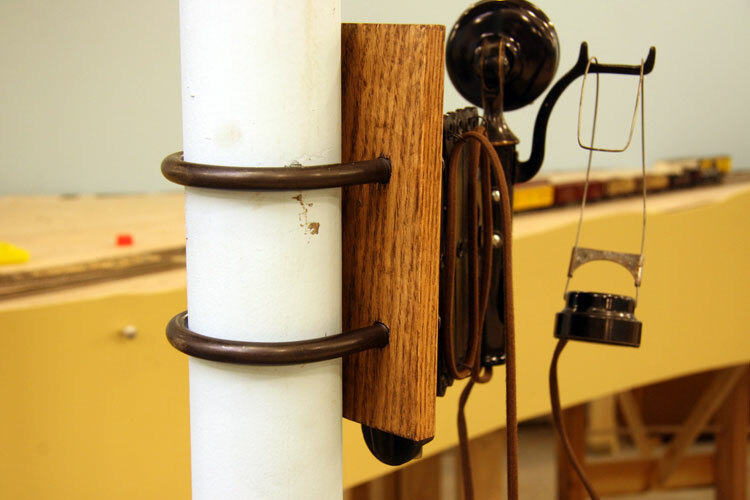 After doing a bit of research on the internet and some experimentation, I developed a system which works and helps maintain the illusion of operating in 1895. 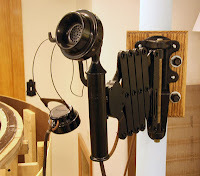 Several years ago, with a large layout in mind, I acquired a number of the old railroad scissors phones along with a few other types of phones. Although these phones are a minimum of 50 years old, they still work well. These formed the basis of the system. I had to attached the scissors phones to the columns in the basement (there are good uses for columns in a railroad room!) so I found some U-bolts at McMaster-Carr and cut some oak bases. I screwed the mounts to the base after fastening it to the column. There weren't enough original mounts to go around so I obtained some new ones from Phoneco. At Stockton and Oakdale, I wanted the dispatcher to be able to contact the yardmasters so a bell was needed. Conversesly, I wanted the yardmasters to be able to reach the dispatcher. 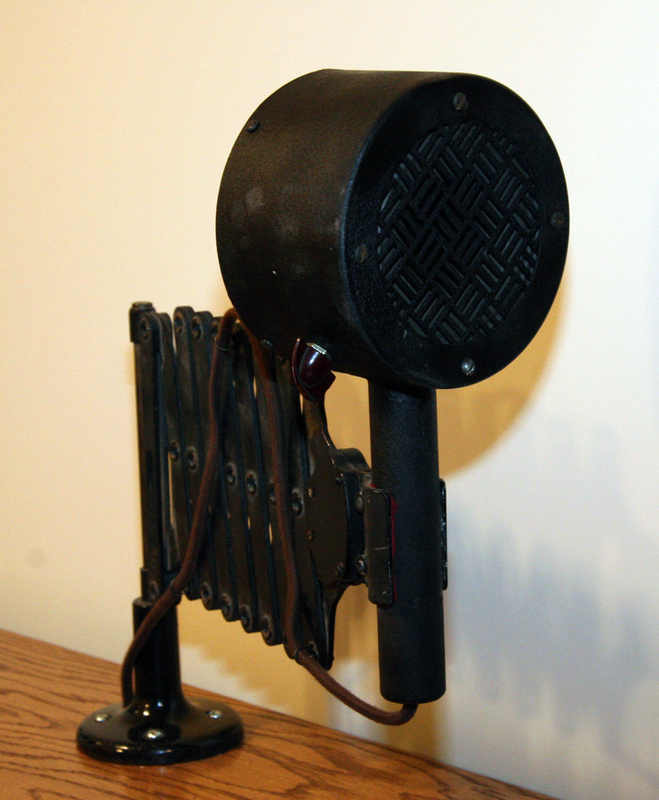 Using what Western Electric called "Interphones" solved both problems. 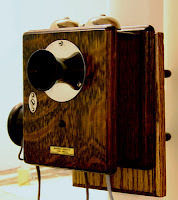 They were very period-looking, had bells and a push-button which could be used to contact the DS. 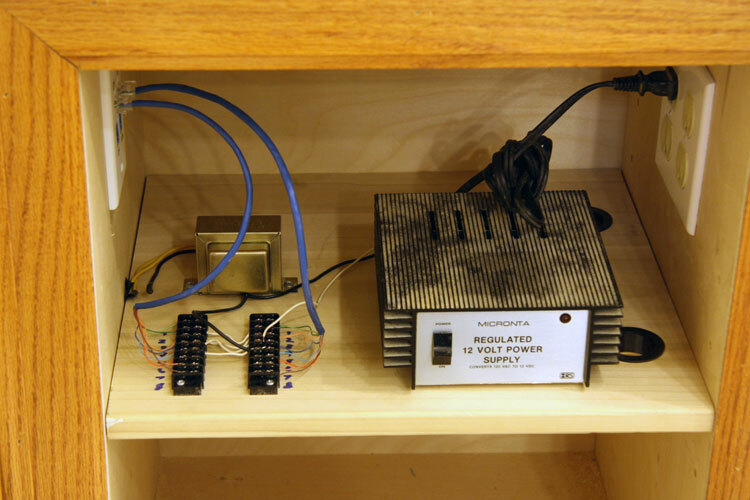 The power supply for the system was constructed from readily-obtainable parts from Radio Shack. Wiring done using Cat-5E cables which were installed in the walls when the railroad room was finished prior to beginning layout construction. I located RJ-45 jacks in the places where I expected to have phones. Since there are eight wires in each cable, there are enough to use for the phones as well as the bell circuits and other things. Two cable systems were installed, one for the main train line and the other for the DS-OP line. These work well. The main thing to remember is to check that the wires are all installed in the plugs and jacks properly. Testers can be purchased for as little as $12 from ebay including shipping. It's a little tricky aligning eight wires from a round cable into a specific order for a flag plug so checking is essential. The power supply circuit is very simple and is easily made. The two wires at the bottom of the circuit connect to the train line as shown below. When wiring the transformer, use only the two wires for the primary side of the unit. The other three wires can just have their ends taped. The wiring circuit for the system is super easy - everything is wired in parallel including the power supply. Each phone used should have the receiver wired in series with the transmitter. In other words, one wire of the earpiece should be connected to one side of the train line. The other wire should be connected to one wire of the transmitter. The other wire of the transmitter should be connected to the other side of the trainline. To connect everything, all you have to do is plug in the phones and then the power supply. 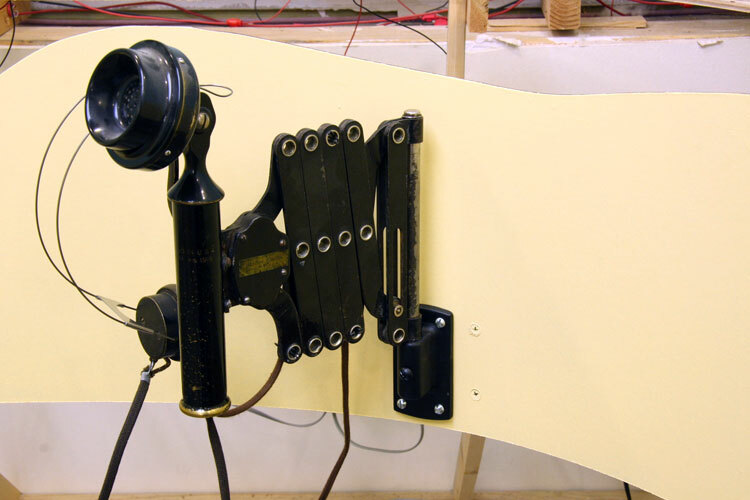 Once the dispatcher's console and the operator's desk were built, they had to be folded into the telephone system along with buzzers and bells to announce a call. I tried to keep it simple. There is a bell system between the operator and the dispatcher. There is also a bell system between the dispatcher and the Stockton and Oakdale yardmasters. The rest of the phones do not have any bells as they will be used only for OS'ing trains. All a train crew has to do is pick up the phone and wait until anyone on line stops speaking. The operator/dispatcher bell circuit is below. In running the Cat-5 cable before the layout was built, I only allocated two wires to this circuit instead of actually figuring out how many I would need. To keep to the original two-wire plan, I had to use two power supplies. The only downside is that both buzzers sound when one button is pressed. I can live with that. There are also some other refinements of the phone system as well. I have a foot pedal at the dispatcher's desk which he can use to switch between the train line and the operator's circuit. A loud speaker is also installed so that the off-duty crew members can hear what is going on. Are you going to be posting your great interlocking as a separate project at some point? Some friends and I want to add dispatcher phone systems to our layouts, but suitable, inexpensive handsets are difficult to find. Do you think your system would work with the 4-connector "retro" handsets sold for smartphones? My sample of one such phone has two connectors wired to the speaker, and two wired to the microphone, so connecting them in series will be easy to do. However, I'm not sure whether the speaker and microphone will be able to handle the 12V. Hi, Ron. I looked at the headsets you mentioned and I doubt that they are designed for the higher voltages used on my system. 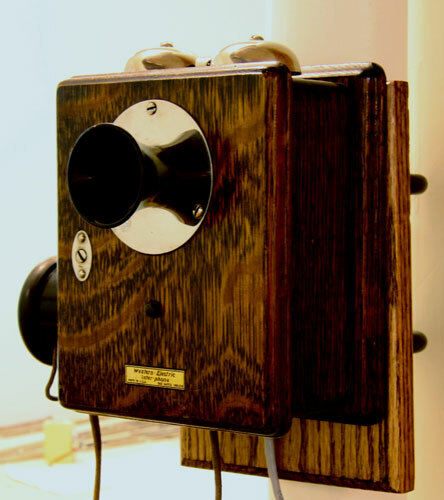 Your best bet would be to look for some of the older handsets at garage sales or used furniture/appliance stores. Good luck.